90% Target Language, Comprehensible Input, or Immersion?? The biggest trends in French and Spanish language classrooms right now are 90% target language and comprehensible input. 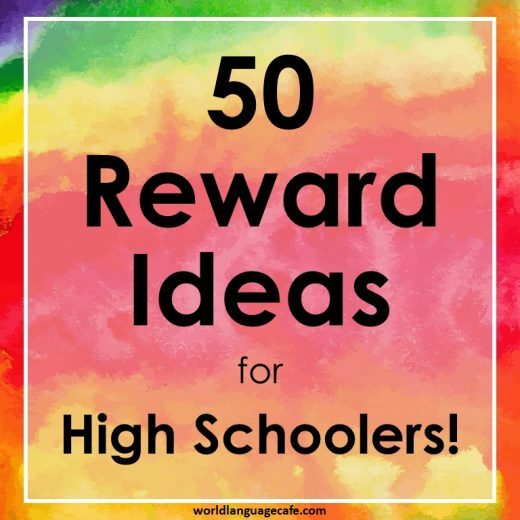 While I agree that these are big improvements on learning methods from the past, personally, I am a strong proponent of teaching 100% in the target language and here’s why . . .
1. With a limited amount of time each week with your students, why spend any of it speaking English? We learn our native languages through 100% immersion. Our parents don’t avoid the past tense because we haven’t learned it yet. They don’t skip using certain words because we don’t know what they mean. They speak to us, explain what they’re saying with other words or model what they want us to do. Since we don’t have that 24 hour a day experience, you need to make the most of your 1-5 hours. For more on this subject, check out: “How Native Speakers Learn Differently Than Language Students“. 2. Students need the deciphering and circumlocution skills that they learn in an immersion experience to thrive in real life situations. It’s actually good for your students to not understand what you’re saying because when they interact with a native speaker, this will happen all the time. They’ll have to decipher what the person is saying based on non-verbal cues, tone of voice, and the parts of the conversation that they do understand. 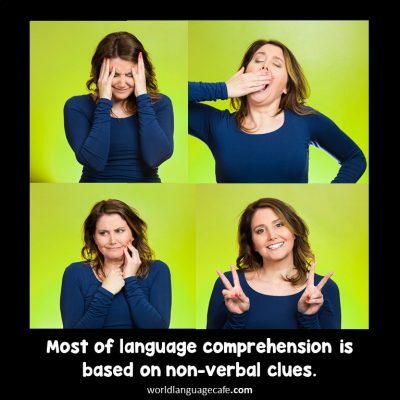 More than 50% of comprehension is based on non-verbal cues. 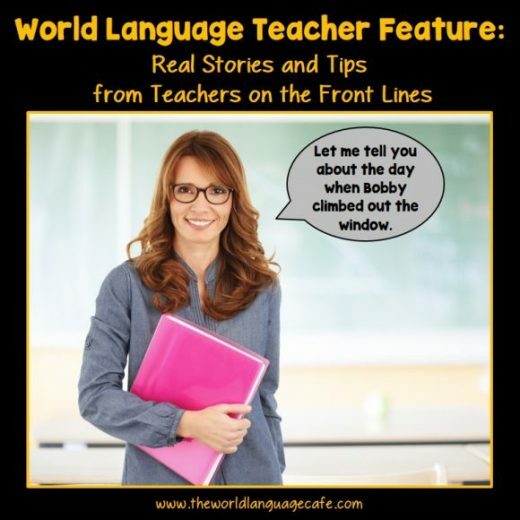 If students have to figure out what you’re saying every day in class, they will get used to not understanding everything and will have the skills and persistence to grasp the gist of the conversation with a native speaker. If they haven’t done this in class, they are much more likely to give up on the interaction. When they’re speaking, they need to know how to circumlocute (work around words that they don’t know) to get their point across. 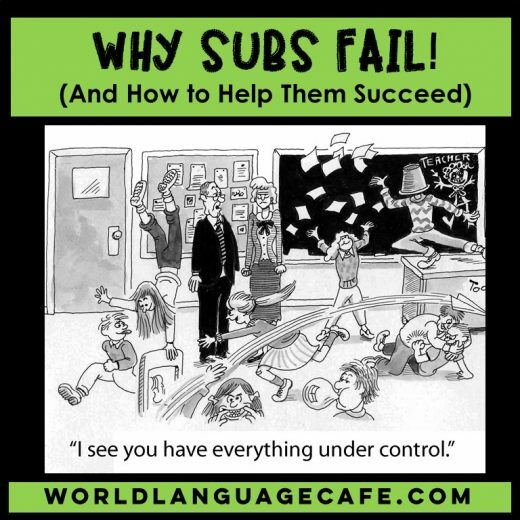 They will never know every vocabulary word, but if they can describe the word or concept that they’re trying to communicate, they will be much more successful language speakers. We do this naturally every day in our native languages. Somebody doesn’t understand a concept or a word and we explain it to them using other words. This is a vital skill for your language students to master. 3. It’s difficult for the brain to switch between languages. Even as someone who is trilingual, I find it tricky to switch from Spanish to French to English. I’m raising my own kids bilingually, and they learn the most when we’re speaking all in Spanish. When we mix English and Spanish, the language learning falls apart. If you speak both languages at once, your brain never learns to create that channel of fluency because the 2 languages become intertwined. I went to graduate school at Middlebury College in Vermont (nationally renowned for teaching languages). Students come to Vermont for 6 weeks in the summer and pledge to only speak in the target language the whole time. The students who had zero knowledge of Spanish at the beginning, spoke, understood, read, and wrote well at the end of the 6 weeks. How do they learn so much in such a short period? Immersion! 4. Students understand way more than you think. I used to teach preschool and elementary students for 1 hour a week and I spoke to them all in Spanish. After 1-2 months, they understood almost everything. How do I know? Because they followed commands and instructions, participated fully in our activities, and laughed when I told jokes. If elementary school students can do it, so can your high school students! Now you might be saying, “But that’s elementary students – their brains are more open to learning languages.” Yes, that’s true, but immersion also works for high school students. I taught a group of high school seniors who came into my class with 6 years of Spanish, but honestly couldn’t say much, didn’t feel comfortable speaking, and struggled with basic grammar concepts. However, after a year of immersion, they were able to communicate well, make jokes, and write short stories. These students told me that they learned way more in 1 year than they had in the previous 6. Why? Because it was an immersion environment! And . . . they loved learning how to communicate with each other in another language! Many of those students have shared how that experience transformed their lives. One married a Hispanic man and was able to speak comfortably with him and his extended family. Another went on to study multiple languages with the goal of becoming an ambassador. Now, am I saying that you should never speak in English? No. I do make exceptions to this rule. In emergency situations, definitely, do what you need to to get your message across. If students come to see me outside of class for extra help, I make an exception. I speak in the target language, but if they are uncomfortable or need to tell me something really important, I give them the option of speaking in English. I know you’re probably reading this and thinking, “I don’t know – sounds too hard – will this really work?” Trust me, it does! You will be amazed by how much more French or Spanish your students learn when you create this type of immersion experience. Don’t be afraid! Try immersion! 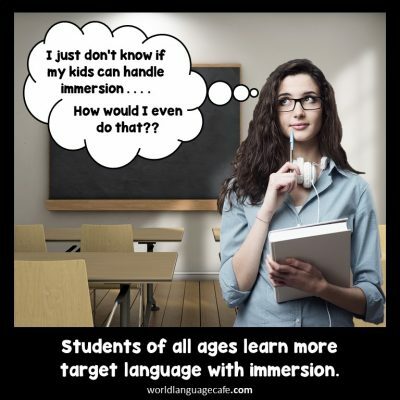 This is a huge struggle for language teachers, so I wrote a blog series about about how to teach using immersion and another about getting your students to speak in the target language. 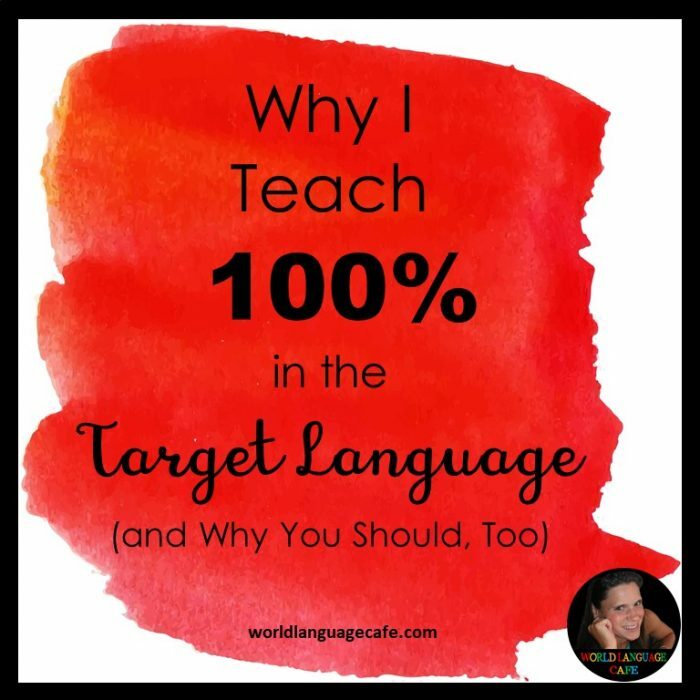 Hope you’ll check it out and that you’ll strive for 100% target language use in your classroom this year! Want some resources to help? Get immediate access to immersion lesson plans in my Free Resource Library by signing up below.